The task in the demo assignment is to search for a given value from a binary search tree. 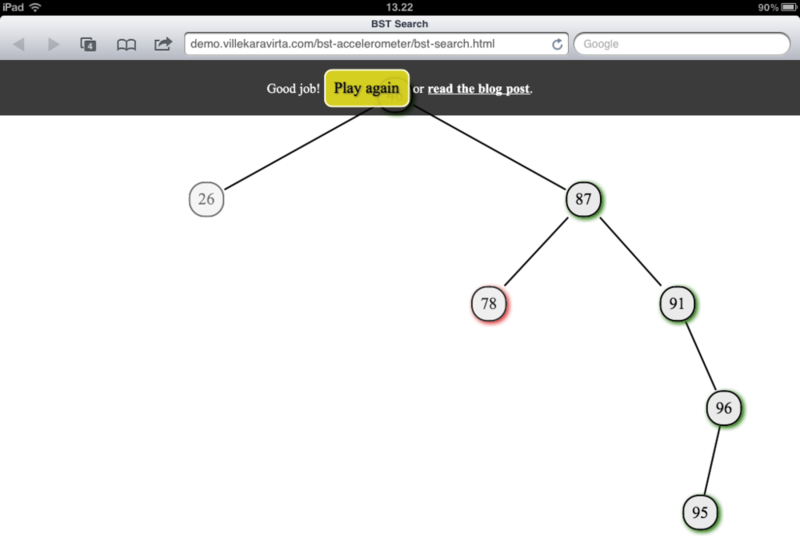 The student should visit the nodes in the tree in the same order that a search algorithm implementation would. The visiting is done by interacting with a visualization of the data structures; in this case, by controlling a ball by tilting one's device. Some people (me included) call this visual algorithm simulation. As a comparison, you can try the traditional version of the BST search exercise (if you have Java installed). After clicking "Okay, let's go! ", a root element (46 in the picture) of a BST is shown. Simulation of the algorithm is done by tilting the device to control the ball (below node 91 in the picture). When the ball is on a node, it is highlighted with green or red indicating correctness of the step. This way the student gets immediate feedback on her progress. When a correct node is visited, it's children are made visible. This is to demonstrate the way the actual algorithm works; it only sees a part of the data structure. Finally, the student is given a change to play again. Or, to read this blog post.